Today, Apple released iOS 9 and will shortly release Watch OS 2 to the world. We know that our iOS customers are really excited about all the possibilities these two new releases bring. We also know that we’ve been very quiet recently about what our intentions for Pocket Weather Australia and Pocket Casts are. Today we’d like to give you an update on where we are now, and what’s coming in the near future. Earlier this year we realised that we didn’t have the resources to give Pocket Weather the love it so deserved. So we hunted low and high until we finally found the perfect person for the job: Jeff Tan-Ang of OzTV fame. We pitched the idea of a brand new Pocket Weather to Jeff. Re-written from the ground up using Swift 2.0 and using all the latest iOS 9 and Watch OS 2 technologies. Jeff was naturally excited, and joined the Shifty Jelly team back in June of this year. He’s been working on it full time ever since. The new version is looking nothing short of amazing. It will support both iPad and iPhone, as well as the Apple Watch. It’s a free update to all our customers who have the current version of Pocket Weather. We’re really excited to bring this to you and we’ll have more details on it closer to release. In terms of timing expect it later this year, before the temperatures swell and Australians hit the beach. At the same time that we were planning the next Pocket Weather release, we were of course working on Pocket Casts as well. It too will be iOS 9 compatible and bring with it some amazingly cool features that we hope to talk about very soon. Thanks to the addition of Jeff, Russell has been able to work on this release full time and it’s shaping up to be our biggest one yet. It will be a free update to all our existing customers. We’ve all been using the new version here internally for a while now and we can’t tell you how excited we are to be able to share more details with you soon. Timing wise it will also ship this year, but we’re keeping the date a secret until just before launch. 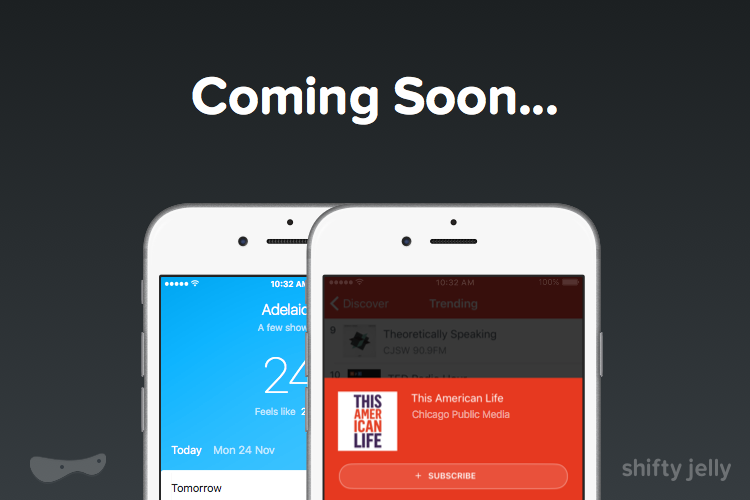 So a new Pocket Weather and Pocket Casts before the end of the year, both with some amazing new features. The entire team (Jeff, Russell, Chris, Monica and Philip) have been working tirelessly to bring you these two new releases and there’s a definite buzz in the office as we lead up to release day. If you’re one of our iOS customers: we think 2015 is going to be one of the most exciting years we’ve ever been able to give you. More details soon, but in the meantime we have code to write, designs to tweak and tests to test. See you on the other side!